We spent over 48 hours researching and testing 15 different types of dog exercise pens and found that ease of set up, durability, and materials used in construction were most important. The IRIS dog exercise pen scored high in all areas and is our top pick. The construction of this pen is heavy duty plastic and can be used indoors or outdoors. It contains 8 panels and more can be added if desired. The pen is rust-proof and high impact capable. Assembly is super easy, just slide each panel in place. The locking latches provide additional protection for your small dogs. Exercise pens for dogs can be very useful if you have small dogs that need to be contained for short periods of time, or you have a dog that has had puppies. As cute as puppies are, having a litter of them running around getting into everything can be very chaotic. These top rated dog exercise pens provide plenty of room for the dog to move around, yet it till keeps them where they can’t do any harm to the rest of your home. They are made from sturdy materials that last a long time and still allow your dog to have socialization and interaction with the rest of the family. .
Dog exercise pens are a great way to protect your belongings and your dogs too. 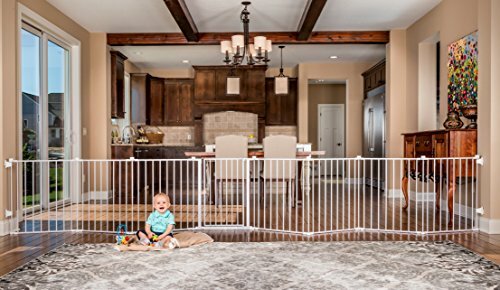 These three top rated dog exercise pens could be exactly what you’re looking for to keep your dog away from certain rooms of the house, away from a new baby that is on a blanket on the floor or any number of other reasons. If you’re looking for a good way to contain your pet, these top rated exercise pens will do the trick. This dog pen is perfect for both inside and yard use. With 8 panels plus the ability to add 2 more, you will have over 21 square feet of space for puppies to play or to keep your small dogs contained. 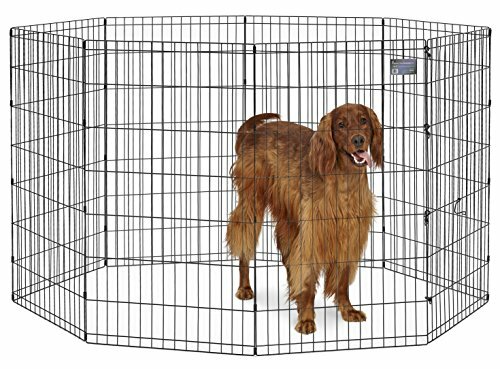 This pen is probably not going to work very well for a larger dog if they are jumpers, but for small dogs and litters or puppies or even kittens, it provides a safe place for them to play while keeping them in and other animals and children out. The IRIS Indoor/Outdoor Plastic Pet Pen is made from heavy duty molded plastic that is high-impact capable and rust-proof as well. It’s made in the USA and built to last years with the proper care and use. The locking latches add additional protection because it can be locked to prevent anyone from leaving the door open. Assembly is easy with the slide-in and lift out connecting rods. All 8 panels interlock with each other as does the two additional panels. These two panels are sold separately but can provide even more room if it is needed. Measurements are 63” x 63” and 34” high. 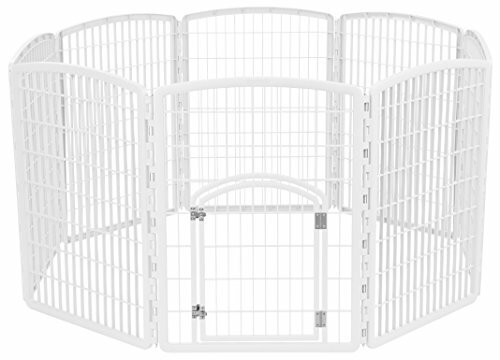 The white color of the pet pen and the rounded tops of each panel are attractive and will complement any type of home décor. The door opens easily allowing your pet to go in and out when you want them to and can be locked when you want them to stay inside. It’s a great pet exercise pen that will provide the protection and containment you need. Great for traveling or camping as well. You can match this pen to your color decorating theme even more. It comes in Chocolate, White, Chrome, Blue Moon, Dark Gray, Everglade, and Garnet. Provide your pet with 19 square feet of contained and safe play area with the Regalo Super Wide Gate and Play Yard. It can be set up in different shapes and sizes to fit your needs and can even be used as a fire place guard or super large opening gate. All the hardware is included so set up is super simple. Each panel is 28” tall and 24” wide, making it the perfect size for small to medium dogs (as long as they are not jumpers) and is the perfect pen for puppies and kittens too. It is designed with a walk thru gate which makes it super convenient, especially if you are using it to contain a little of frisky puppies. It has a locking latch that is able to be opened one handed. If you would rather use it as a gate, all of the hardware is included to mount it properly. Take down is easy and you can fold it up completely so you can take it with you on trips or camping or store it away when it’s not being used. The metal of this exercise pen is coated with a non-toxic powder coating that meets ASTM standards and JPMA certifications to ensure your pets’ safety. If you want to contain larger dogs, this exercise pen fits the bill with FIVE different height levels to choose from ranging from 24” high to 48” high. This is perfect for larger breeds and makes a great containment area for litters of puppies as well. There are 8 panels included with this pen providing plenty of square footage. The Black E-coat is durable and resistant to corrosion and rust so it will last a long time. It contains ground anchors which are great for when you are using it outdoors. Storage is easy because the whole unit folds flat and can be stored under the bed. This convenient and versatile exercise pen is available in Black, Satin Black E Coat and Gold Zinc if you prefer. When it comes to a great containment area for your pets, Midwest is great because it works for small, medium and large breeds as well. When it comes to finding a quality dog exercise pen for your dog, you don’t have to look any further than these top rated pens. Made from safe, quality materials that stand up to daily use, your pets will be contained in a safe environment that is easy to set up, take down and even travel with. Having a safe place to keep your pet if you need to keep them separated from certain rooms is a necessity, especially when you have young puppies or even kittens. All three of the top rated choices we have reviewed here will provide all the safety you want for your pets. Continue reading below to learn even more about choosing the right exercise pen for your dogs. We’ll share with you what to look for when you are researching and shopping and how to tell a good quality dog exercise pen from a lesser quality one. With the right information you will be able to choose which one fits your needs the best and be confident that you have chosen something that will last a long time. What is a Dog Exercise Pen? A dog exercise pen or pet pen is used to contain your pet in a specific area, either inside or outside. It can be used in a yard to keep puppies or dogs contained or inside for the same purpose. Take it on a camping trip to keep your pets safe while in a strange place. Some people use them for dogs and also their other pets when the dogs aren’t using them. These dog exercise pens provide the ability for small to medium dogs to run around safely and get some exercise in a controlled area where they can’t get hurt. They should not be left in the exercise pen unsupervised or while no one is home. These pens come in many different styles and materials that work for almost every need a pet owner could have. What Size Pen Do You Need? Things that determine the size dog exercise pen you need will include the size of your dog, his or her strength and whether they are chewers or not. Another factor is whether they are climbers or jumpers, which will determine the height of the exercise pen you need. You also need to take into consideration what the exercise pen is made of. You have many options available. The size of the dog exercise pen will be the first decision you start with. This is also determined by the space you have for it and where you will be predominantly using it. If you are using it indoors, measure the area you will be keeping the pen set up to see how large of a pen the space can accommodate. Most exercise pens have sections, typically 6 to 8 in the standard package, that connect. You can put them together in many different ways to fit your needs. Many also have additional panels that can be purchased to make the pens even larger. You want to consider the height of the dog exercise pen as well as the overall space it provides. Height is especially important for the larger breeds that could almost step over a 24” pen. Fortunately if you have a larger breed, there are exercise pens that are all tall as 48” high. When buying a dog exercise pen make sure you buy one that will accommodate the dog when it is grown not just when it is a puppy. The exercise pens that have high panels are a bit more difficult to travel with, but not impossible and just need a little extra space and consideration when packing them up. A high walled pen is perfect for small dogs that are climbers or jumpers or larger dogs that are jumpers. You will still need to keep an eye on them though because if they are prone to climbing and jumping they will certainly try regardless of how high the pen is. Each one has their use as well as benefits and drawbacks. The material that the exercise pen is made of will also determine how durable it is and how much it costs as well. We’ve outlined each type below. Metal – A metal exercise pen will be the most expensive of the three materials. This is due to the fact that they last longer and are much more durable than plastic and mesh pens. Metal dog exercise pens can’t be chewed through and they are much more difficult to knock over or lift up. One potential drawback to a metal exercise pen is that if it is not maintained and taken care of, sharp points or the ends of the metal wires can stick the dog. For this reason, be sure that you inspect a metal exercise pen regularly to ensure there are no potential hazards. Most metal pens will come in sections so the user can configure them into different shapes or sizes according to what they need. They are definitely best suited for outdoor use and on concrete floors or carpeting due to the fact that in wood, tile or linoleum, they can cause scratches if the pen is moved. Plastic – Plastic dog exercise pens are popular for many reasons, one of which is the lower cost that is usually associated with plastic pens. They are good for both indoor and outdoor use and won’t rust, scratch the floor or have sharp points that can poke your pet. The plastic these are made from is usually very sturdy and durable and can be cleaned easily as well. They go together in the same manner that the metal pens go together, sections that connect together. Because they are much lighter than the metal pens, they are more convenient to travel with. Because they are lighter, a larger dog can push them around much easier so that is another thing to consider before choosing a plastic exercise pen. Mesh – Mesh is the cheapest of all of the exercise pens available on the market. They are also the least durable of the three types. If you are using the exercise pen for puppies or dogs that love to chew, a mesh exercise pen is not a good idea since you may not have it very long at all. They are much more comfortable usually than the other choices and may make a great pen for super young puppies or a small, non destructive dog that does not chew. Mesh pens are a great choice for those who travel a lot with their pet and want containment where they are traveling to, such as in a hotel room or at a campground. Some people buy mesh exercise pens in addition to a metal or plastic one. The mesh type they take on the road with them and the plastic or metal they leave at home. One drawback to mesh exercise pens is that they are very difficult to clean properly. There are a few other things to look for when you are researching the different choices available on the market. Additional Panels – If you want to expand the square footage of the exercise pen, you will need additional panels to do this. Many models have additional packs of panels that you can purchase separately to increase the overall size of the exercise area. This is a great idea for larger breeds or if you have several dogs in the pen at once. Ground Stakes – Many dog exercise pens come with something called ground stakes. These are used to keep the pen in place even if the dog tries to test the waters and push against the sides of the pen. If also prevents the dog from flipping the pen upside down. Inside you can get stabilizers which do the same thing but are for indoor use. Guarantees or Warranties – Look for models that offer some type of guarantee or warranty on their exercise pens. This shows that the company stands behind their workmanship and quality. The warranty doesn’t have to be ridiculously long, but even a one year warranty is better than nothing being offered to give the customers additional peace of mind. Here are a few tips to ensure that your dog’s experience with his exercise pen is a positive one. Check the pen for exposed screws or pins that can stick your dog. Especially the metal pens. All of the ends should be bent away from the interior of the pen and not be exposed where they can scratch the dog. Before putting your dog into his exercise pen, remove his collar and/or leash, they can get caught on the frame. Never leave your dog in the exercise pen outdoors unattended. You should also never leave them in it in the heat and sunlight outdoors. You want to find a good place outdoors especially, that has a mix or sun and shade. You also want to ensure that you put water inside the pen at all times so they have access to fresh water when they need it. Indoors you will not need to provide water inside the pen in case it would be knocked over onto the floor, but make sure you offer it to them on a regular basis so they do not become thirsty. An exercise pen should not be where the dog spends day and night. They need human interaction, walks, playing catch and even interacting with other pets, children and people. The information in this buyer’s guide can be used to sort through the variety of dog exercise pens on the market. When you know what to look for, choosing the right one is much easier. Take into consideration your own needs and preferences, as well as the breed of dog you have when making your decision. Now that you have the knowledge you need to determine whether an exercise pen is a good one you can research and shop with confidence that the one you choose will be the best one for your money and the best one for your dog as well.